The construction of Veranza Mall which is said to be opened by November this year is now in full swing! 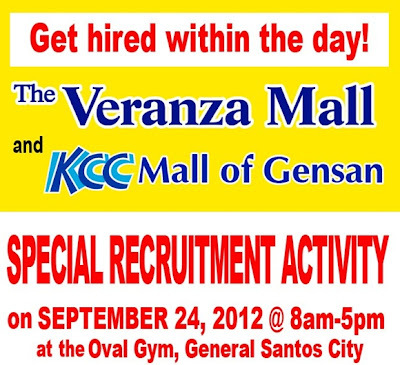 And on September 24, together with KCC Mall of Gensan, Veranza Mall will be holding a SPECIAL RECRUITMENT ACTIVITY. 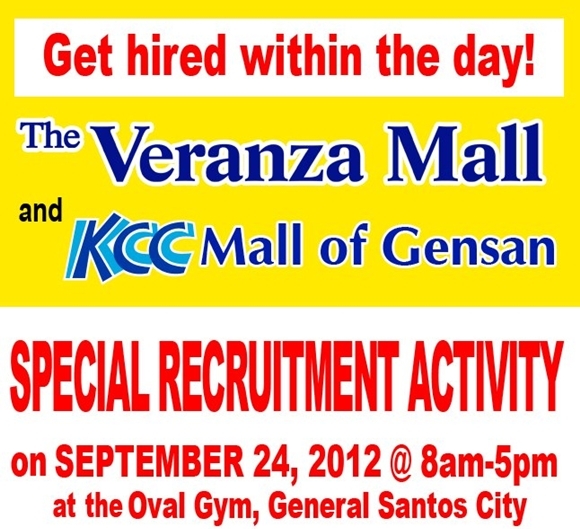 The whole day event will be held at the Oval Gym in General Santos City and will have many of KCC Mall of Gensan and Veranza Mall's tenants/ retailers looking to fill open positions. So, calling all job seekers from South Cotabato and Soccsksargen, save the date, dress to impress and be ready with your comprehensive resume, photocopy of Transcript of Records, and Certificate of Employment (for applicants with work experience). Activity will start at 8am.